To help accomplish this, the New York-based company asked its 2,000 network salons to participate in its Curl Culture campaign to come up with unique ways to spread the gospel of curl pride. To motivate them, the company held a contest. The salon that came up with the most creative campaign would win a day of training with Bumble and bumble's top educator -- 'our rock star teacher' -- Howard McLaren, vice president of technical development. It's a prize worth $50,000. During the five months of the contest, which ended in mid-January, the majority of salons did something to support the line, whether it be wearing their hair curly, wearing Curl Conscious T-shirts and buttons or displaying collages and look books of curly hair. But for many salons, that was just the beginning. One salon had a special book where customers with curly hair could leave their thoughts about curly hair. Another hosted a poetry slam about curly hair. A California salon launched Curlculture.com, a Web site devoted to curly hair and the Bumble and bumble Curl Conscious line. 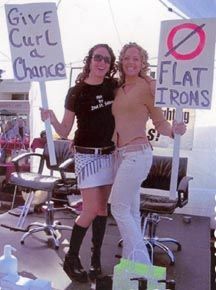 Detour and 2nd Street Salons in Encinitas, Calif., for example, participated in a street fair where they picketed straight hair, created a documentary called 'Give Curl a Chance,' and even had media at several of their events. 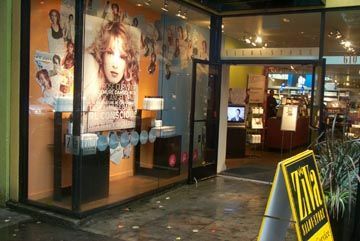 Industry, a salon in Syracuse, New York, submitted photos of their fabulous merchandising of Curl Conscious and included chalk drawings on the walls of the salon to promote curly hair and a curlier culture. Goldwaves Salon in Fort Worth, Texas held a Kick-Off Party, complete with a curly menu of curly pasta, spiral cut veggies, a chocolate roll cake, and spiral cut sugar cookies. They even had 'curly trash' where clients came in with their old curl products and tossed them in the trash! The winner of the contest will be disclosed this month (March). The biggest reward hasn't just been product sales, which have been strong. It's seeing more people putting away their blowdryers and flatirons, letting their curls do their thing. Company spokeswoman Julia Sloan said she's one such person. In the past, she never wore her hair curly. Now, she said, she wears it curly most of the time. Although the official contest has ended, Langer stressed that the company's efforts to promote curly hair have not.